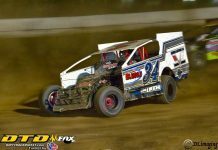 VERNON, NY – Mother Nature forced Utica-Rome Speedway officials run a fast-paced show to attempt to get the full show in on Community Car Wash and Bill Herrig Auto Parts night. The CSRA Sprint event saw Jeff Trombley score the win while Rocky Warner dominated the King of Dirt Sportsman Series event. The Gates-Cole Auto Insurance Modifieds and the King of Dirt Pro Stock Series event were both lost when heavy rain moved in. The Gates-Cole Auto Insurance Modifieds feature event will be made up on June 25, making a double header event for the Modifieds. The King of Dirt Pro Stock Series makeup date will be announced. Cody Bleau and Nick Krause led the 30 car King of Dirt Sportsman Series field down to the green flag to begin the 30-lap event and it was third place starter Connor Cleveland that led at the conclusion of lap one. Cleveland would lead Krause in the early stage of the event, but ninth place starter Rocky Warner was charging towards the front. Buy lap four, Warner was up to third when the yellow flag flew for the disabled car of defending track champion Matt Janczuk. The restart saw a four-car pileup, and then on the ensuing restart, Warner started chasing the top two cars of Cleveland and Krause. Lap six saw Warner make his move as he passed both of the top two cars to the lead. Warner continued his mastery of lapped traffic as he continued to lead the remainder of the event with Cleveland trying to keep pace. Pitts made a lap 27 pass to grab third from Krause and when the checkered flag flew, it was Warner leading Cleveland, Krause, Jeremy Pitts, and Michael Sabia. The CRSA Sprint 20 lap event began with Kyle Smith and Emily VanInwegan bringing the field with Smith taking the lead. Smith would lead through lap seven until sixth place starter Josh Pieniazek took over the point on lap eight. Pienaziak was firmly in control until a miscue by a lapped car caused him to flip off the top turn one and two on 12. Pieniazek’s night was over with Smith taking advantage and regaining the point. On the restart, Smith would hold the point with Jeff Trombley in tow with Trombley applying heavy pressure for the lead. Smith jumped over the cushion on lap 17, allowing Trombley to slip by and run off with the win. Smith finished in second with Mike Kiser, VanInwegan, and Dalton Harrick filling out the top five. 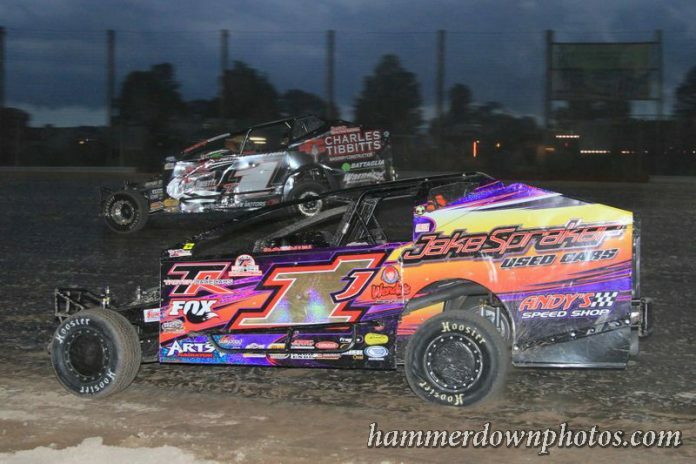 Exciting racing action returns to Utica-Rome Speedway on Sunday June 25 when Wilber-Duck Chevrolet presents the 2nd Annual Mike Martin Memorial $1,000 to win for the Broedel Energy Sportsman and double 30 lap features for the Gates-Cole Auto Insurance Modifieds plus Pro Stocks and Novice Sportsman. 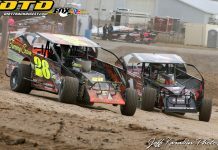 Gates will open at 3:30 p.m. with racing at 6 p.m. For more information, log on to www.uticaromespeedway.com or call (315) 829-4557. CSRA SPRINTS A-MAIN FINISH(20-LAPS)- JEFF TROMBLEY, Kyle Smith, Mike Kiser, Emily VanInwegan, Dalton Herrick, Thomas Radivoy, David Ferguson, Jeremiah Munson, Dustin Purdy, Dana Wagner, Christian Rumsey, Tyler Jashembowski, Tyler Cartier, Sydney Prince, Jerry Sehn, Ed Strada Jr., Josh Pieniazek, Frank Connelly, Brett Jaycox, and Andy Durie. DNS-Leo Yeager. KING OF DIRT SPORTSMAN FEATURE FINISH (30 LAPS)–ROCKY WARNER, Connor Cleveland, Jeremy Pitts, Nick Krause, Michael Sabia, Chris Mackey, AJ Filbeck, Chad Edwards, Dave Marcuccilli, David Schilling, Kevin Chaffee, Brian Calabrese, Andrew Buff, Scott Duell, Mark Effner, Brian Pessolano, Kyle Inman, Stephen Denton, Jason Rood, Kyle Kiehn, Charlie Tibbitts, Jack Lehner, Cody Bleau, Chris Lynch, Justin Smith, Matt Janczuk, Kyle DeMetro, Brent Joy, AJ Miller, and Jeff Watson. DNQ-Dave Moyer, Nathan Peckham, Tyler Thompson, George Dyer, Jeff Taylor, Robert Bublack Jr., and Rob Maxon.